Happy Holidays! As we near the end of 2014, I wanted to express my gratitude for your ongoing support of our chapter. We’ve had great success restoring several of our West Michigan coldwater resources, and are working hard to sustain our efforts. Some of our recent projects include the removal of dam debris and stabilization of banks in the Childsdale stretch of the Rogue River, and we are embarking on a long term program for improvements in the Buck Creek watershed. We are also nearing our goal of establishing a self-funded scholarship that will help educate the next generation of coldwater conservationists. Our success is directly linked to you, our members and supporters. We’ve demonstrated our ability to maximize grants, financial donations, and volunteer hours to sustain our local operations and seek new opportunities. Included with this message is a summary of our financial performance over the past 5 years. 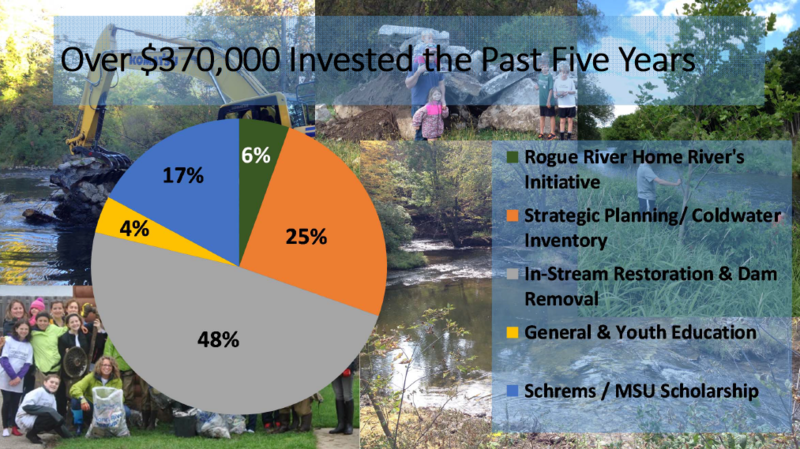 As you’ll see we are using your dollars to protect and improve our local coldwater streams, and educate our community on the importance of improving and protecting these resources. Consider a year-end, tax-deductible donation to Schrems (click here to donate: https://swmtu.org/donate-to-swmtu), and be sure to attend our upcoming annual banquet on April 23, 2015. Thank you for your generous support of Schrems!